We shared our preview article (in french) for Ratchet & Clank yesterday but what's better than gameplay footage for a good look at the game? Here are three gameplay videos. The title is coming next month on PS4. The flickering and aliasing (especially noticeable in the flying-video) is really apparent. Takes away the Pixar-feel I´m sure they where going for. A real bummer in an otherwise lovely looking game. The semi-stable framerate doesn´t help either. The release schedule for this game is so annoying. It comes out April 12 for US, 15 for just France, 20 for Europe and 21 for UK. WTF? In all honesty it doesn't look any worse than in every other game running at 1080p that doesn't use a higher level of TXAA or TAA. The aliasing you're describing is only noticeable on finer details at a distance. Which is pretty much impossible to get rid of at 1080p. I game primarily on a high-end PC by the way. A couple of meters away from an HDTV though this won't be noticeable at all. I doubt it in any case. Nah, i see it too and you can bet you will see it on your own HDTV as well, no matter if you sit away a bit farther than usual. I recently tried this for Rise of the Tomb Raider, hoping the nasty aliasing on tree branches and such would be less visible, but i still clearly saw them. In the Ratchet video, the flying video you can see it on things like the fence in the beginning and other things in the distance as well. It's sadly still an issue for some console games. What the f**k are you guys complaining about??? This is one of the best looking games till date. I don't care about your BS!!! Have some fun in your life for f**k sakes! This looks lurvely. And i enjoy the gameplay...Sadly insomniac don't understand humour so it'll never be as great as it should be and certainly no Pixar. This franchise has always been far too rinse and repeat for me. Very very overrated games. I tried a couple and they all got boring far before the end of the game. Looks great as always. Even the PS2 HD remaster on PS3 was good looking lol. Looks great and all but the real question is does it look better than Tomb Raider? The answer is no, it is unrivaled. Seeing this in proper quality...looks amazing really. Rise of the TR has its very pretty moments, but also plenty of moments where i can clearly see that it's a cross gen game. Especially in Soviet Installation and Geothermal Valley hub areas. It's a difference of night and day with the very first level in the snow and interiors like caves, crypts, tombs, etc. Such a bad frame rate. Can't even hold a steady 30FPS. Shame it's not on PC so there's at least a playable version instead of a slideshow. 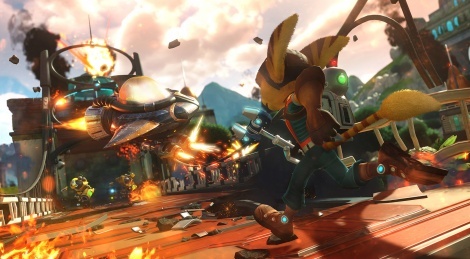 Hmm... hmm... hmm... damn Rachet & Clank still looks good. Gameplay and visuals look on point. All they have to do to get my money is make the game as long and fun as the old games. Multiplayer would be nice too, but that SP comes first. 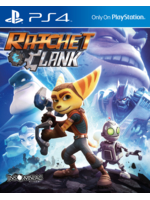 This is a remake of the first ratchet with a lot of extras, so it should at least be longer then the original ratchet and clank. Its already discounted to $40, support game developers that take risks like this! Just like the remake of Oddworld Abe's Oddysee, the team are clearly proud of their original work. That Novallis area in particular looks very familiar with the layout still mostly unchanged. @NoClipMode Who is stopping anybody from making a Pixar looking game for PC and exclusive too so it can get some insane graphical benefits like the latest version of the biggest franchise on PC The Sims 4....................oh wait. No thanks on remakes. I'm done with remakes no matter how cheap. Looks good though. They think it makes them "smart" to be "critical". And they take the "crit", as in "criticize" to be the definition of "critical". +1? Really? Is it wise to encourage such aggressive behavior on GSY?